This small and inexpensive tracker has a long range, but is it enough to make it worth the purchase? The MYNT ES Size & Weight are far below the industry standard, making it convenient to carry, and the Range and Battery Life are some of the best we've seen. The overall size of the Network is incredibly small, meaning that if you lose your tracker in an Uber, or want to track an item through an airport, you are unlikely to get any pings other than your own phone. If you forget where you put your keys in your home, this might just be the tracker for you. If you tend to leave them at coffee shops, however, you might want to find a tracker with a larger Network. The Value of the MYNT ES is very dependent on what you intend to use it for. If, for example, your usage is to find your keys or phone within your own home, the MYNT ES might just be the best choice for you. However, if you tend to lose your keys in public, and want the device to be able to track them down, the small Network of users makes the Value of the tracker fairly low. This is because, in our testing, the only hit you are likely to get is from your own phone when you walked away from your keys, but not if they happen to move (such as leaving them in an Uber). Like most trackers, there is not much in the way of design for the MYNT ES. The device is a rectangle with rounded-corners and a hole on one end for attaching to keys or other items. On the other end, it features a single multipurpose button. Other trackers' buttons can be hidden and unintuitive, but the ES makes its button obvious. On the upside, the button makes it easy to know how to use the device. On the downside, the more obvious button makes it easier to push on accident, which is detailed in Controls. The design of the app is also fairly minimal. The interaction with the tracker itself is straightforward, but some of the other aspects of the app are not as obvious. For example, the FAQ and Support sections of the app are hidden under the Settings icon, while the implementation of the MYNT Coin, which is their closed cryptocurrency, is a primary tab, along with list and map (both tracker-related options). The app also explains how to earn MYNT Coin, but does not give any ideas as to why you want them. One of the most difficult issues to overcome for a tracker is the network. Without a large network of people running the app, finding your tracker if it is lost in an unknown location, or to follow it through an area (such as an airport) is far more difficult. You need a lot of people to be running the app to be able to ping the tracker. Currently, the network is very small. While traveling to both CES 2018 and Collision Conference 2018, our MYNT ES was placed into luggage with the intention of tracking the bags through the airport. Unfortunately, the only times that the location was identified was when it was within range of our own test phone. We have also turned off Bluetooth on our phone around town, hoping to see if the device would ping anywhere. So far, only our phone is running the app. While the market leader has accomplished a large network by integrating their technology into other devices, such as Bluetooth headphones, MYNT has taken a different tact. Since the tracking technology is based on blockchain, the company has implemented their own cryptocurrency: MYNT Coin. Even if you do not have a device, you can earn MYNT Coin by running the app. That is a good encouragement to expand the network, assuming they can market the coin. Currently, the app explains the different ways to earn MYNT Coin, but there is no explanation as to what you can use the coin for, and the company's website doesn't mention it at all. The process of pairing followed the instructions explained in the Setup section of this review, for the most part. We did experience an issue pairing the device that was not covered by the instructions, however. We began pairing the device once, and the app closed unexpectedly after the phone's screen turned off. When we returned to the pairing process, holding the pairing button down did not play the music to indicate the tracker was in pairing mode. This was because the tracker remained in pairing mode without any indication. The process of pairing followed the instructions explained in the Setup section of this review. There were no issues with pairing this device. The range of the MYNT ES is far longer than you would expect from a device of this category. In a direct line-of-sight test, we were able to get a full 60ft from the tracker and still trigger the device to ring (and stop ringing). Within our offices, there is not a space where we lose connectivity. This range is almost as good as standard Bluetooth devices, such as speakers or headphones. If looking for your device with your phone, or vice versa, within your home or office, chances are you'll be within range. The MYNT ES runs on a single CR2032 button cell battery. During the testing process over the past month or so, the battery has remained at 100%. While there is no real way to test the overall battery life in a real world scenario, the fact that the battery is still at 100% after testing indicates that the battery should easily last a year or longer under normal usage. Once the battery does inevitably die, replacing it is an easy process, with an easy to remove cover, but not so easy that it opens on its own. Generally, the controls on the MYNT ES make sense. Once Setup is complete, long-pressing the single button will make the paired phone make play music. Pressing the "Ring MYNT" button in the app will make the tracker play music. Within the app, you can see the last time a device encountered your tracker and get an alert when you come back within range, making it easier to find if lost. The one oddity to the Controls that makes using the ES occasionally annoying is what happens when you tap the single button. Upon a single press, the tracker beeps. This would not be a problem if it wasn't so very easy to press, especially if attached to your keys. In a pocket, backpack or purse, the button seems to get pressed semi-often. This means that simply walking around with your keys can cause you to start beeping randomly. In case you're interested, an unsolicited beep from a backpack going through TSA at the airport will guarantee your bag is opened and emptied. If you complete the Setup process in a single sitting, the learning curve is very small. There is very little that you need to know about how the tracker or the app work, as the app walks you through most of the standard process. However, if you don't follow the process completely the first time, you would normally have to intuit the process of resuming once the tracker is in pairing mode. Luckily, our Setup instructions explain how to recover. The tracker itself is built fairly well. None of the seams are sharp, all of them fit flush together, even after opening the case to replace the battery. Even after carrying the tracker for over a month in pockets, backpacks and luggage, the seams have not even gotten any dirt in them. The only real issue is the ease of which the button is pressed. Possibly a different switch under the button would make it less casual to press, and instead only press when there is purpose. The app, on the other hand, seems to have far less thought put into it than the device itself. Depending on whether you use the iOS or Android version, the behavior is different. The one constant is the large number of spelling and grammar errors throughout the app. On Android, we noticed spelling and grammar errors during the process of registering an account as well as transferring an account from another device. On iOS, there was a whole panel of the account creation process which was blank. On both platforms, the information about the MYNT Coin was difficult to understand because of the high number of grammar issues. The capabilities of the MYNT ES are pretty standard: the ability to know when it is in range of your device, to make both sides trigger the other, and to know when another device (not yours) comes into contact with your tracker. These features make the MYNT ES on par with most of the devices in this product category. There are some features that MYNT does not allow, which would make the product even better. For example, an auditing mode would be fantastic. As it is, you can only log into your account on a single device. The company's website allows you to login to your account, but has no abilities once logged in. But, it would be great if your tracker were paired to your phone, but you could verify its status, and possibly even locate the device, from a tablet or PC. With an auditing mode, a parent could also keep an eye on the device while their kid carries it on their keys. 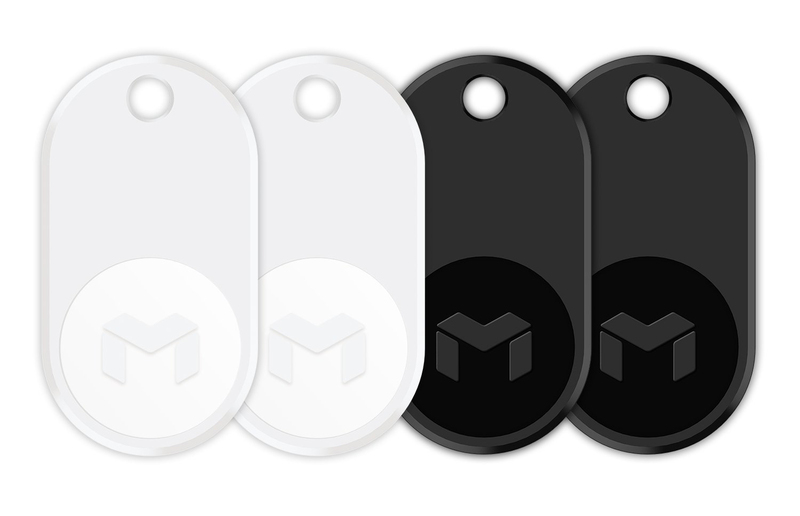 The MYNT ES is physically one of the smallest Bluetooth LE trackers we have used. It is far smaller than the market leader and lighter weight, as well. This makes the tracker fantastic for attaching to your keys or other normally carried items. Normally, in a device this small, making it smaller has a negative affect on the Battery Life, but in this case it does not seem to be an issue. The MYNT ES works well on both iOS and Android. The standard Setup process is easy, though stopping mid-process makes it less obvious, and operation is about as easy as you would expect. The lack of access from either a Windows device or from the web is a definite disappointment and limits the device's Functionality. The pairing process on the MYNT ES is pretty straight forward. You long-press on the single button to put the device into pairing mode, and use the app to find the tracker (it should be the only one listed, so long as you only try to pair one at a time). Once the device is paired, give it a name and you're done. It is important to note, once the tracker is in pairing mode, there appears to be no way to take it out. If you stop in the middle of the process, the tracker will remain in pairing mode until the process is completed. This means that, when you come back to try pairing the tracker later, the device will not play the pairing music again, but it will still work as expected.